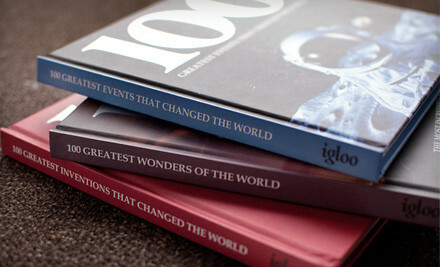 Igloo Book’s hardcover 100 Greatest series recounts human history’s greatest moments and places in vibrant books. Vivid photography and text fill the pages of 100 Greatest Events, which documents scientific discoveries, timeless human endeavors, and births of Big Birds. 100 Greatest Inventions takes page sifters along an expedition from the wheel to the satellite, and 100 Greatest Wonders showcases jaw-dropping spaces from Yellowstone National Park to the temples of Angkor Wat.